One that DOESN'T OWN ANY HOTELS! 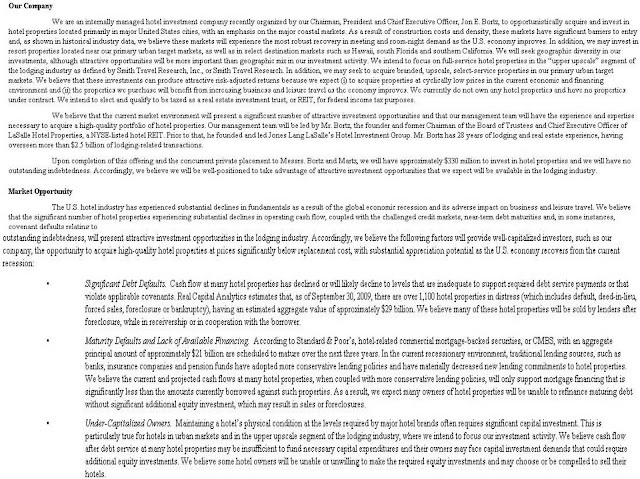 I present to you, the world's most pristine Hotel REIT balance sheet! Pebblebrook Hotel Trust (PEB) executed a public stock offering today - about 17.5million shares offered for $20 each. They currently own nothing, and plan to use proceeds from this offering to acquire interests in hotels opportunistically, in part by focusing on situations where the owners are in financial distress. The registration document is quite long, but offers some great detail on their strategy and risks involved. To make a long story short, the great thing about this stock is that there is no debt overhang, nor withering properties or loans on the balance sheet. The main risk, highlighted below, is that the (hopefully prudent) management cannot find an acceptable place to invest funds. -->>We were organized in October 2009 and have no operating history. We may be unable to successfully implement our business strategy or generate sufficient operating cash flows to make or sustain distributions to our shareholders. -->> We will rely on third-party hotel management companies to operate our hotel properties under the terms of hotel management contracts. Even if we believe our hotel properties are being operated inefficiently or in a manner that does not result in satisfactory RevPar or profits we may not be able to force the hotel management company to change its method of operating our hotels. -->> We currently do not own, and have no agreements to acquire, any hotel properties. We have not identified any specific hotel properties to acquire or committed any portion of the net proceeds of this offering or the concurrent private placement to any specific hotel property investment. Accordingly, you will not be able to evaluate the merits of any investments we make with the net proceeds. We may be unable to invest the net proceeds on acceptable terms, or at all. "In addition to the W Hotel, Istithmar also owns Mandarin Oriental in Manhattan. The hotel was valued at $340 million when Istithmar bought a 73% stake in 2007. Since then, with occupancy rates falling, its annual cash flow plunged to $3.6 million from about $21 million, according to Realpoint. Now the hotel is worth $123 million, also less than its outstanding debt." UK investors get tough! Um, anonymously. London's Mayor proposes "GSBS" ?? ?